This slightly sweet custard-like pudding has a rich flavor and creamy texture that takes no time at all to prepare. 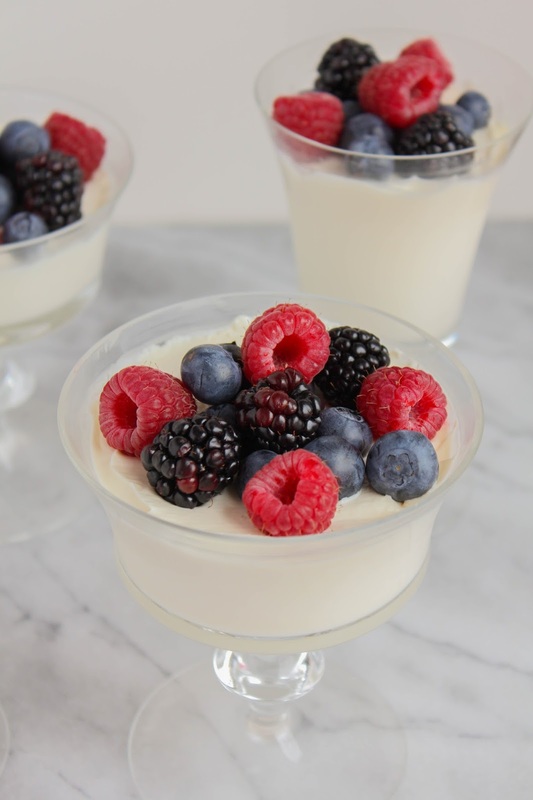 Topped with fresh berries, it's the perfectly light dessert to top off any meal! Panna cotta is a classic Italian dessert made of sweetened cream that's been thickened by gelatin. You can infuse the cream with spices, or even with vanilla or coffee. I first tried panna cotta at a local Italian restaurant several years ago and quickly fell in love. It's creamy texture and delicate taste is the perfect dessert for just about any meal. This week's #SundaySupper event is all about Family Style Italian Recipes. 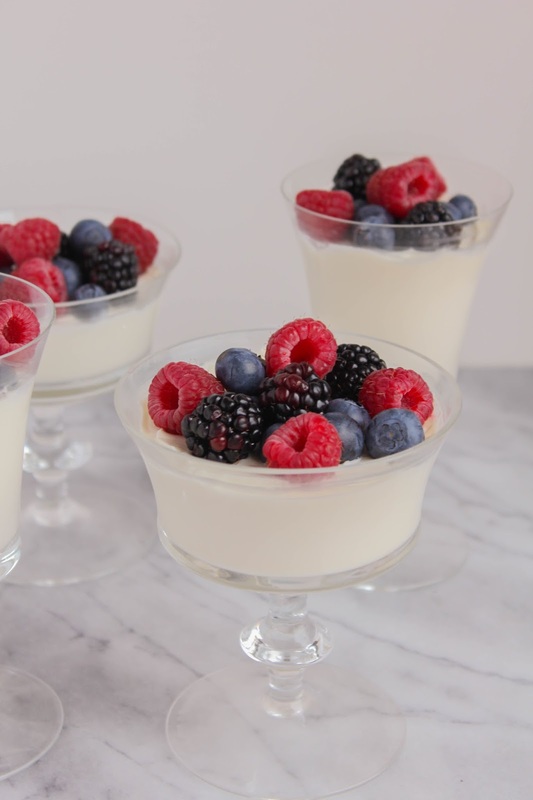 As soon as I heard this was our theme, I just knew I had to share my recipe for panna cotta. It's simple, can be made ahead of time, and has a gorgeous presentation. It's just the right dessert to serve your family after Sunday Supper, or at your next party! 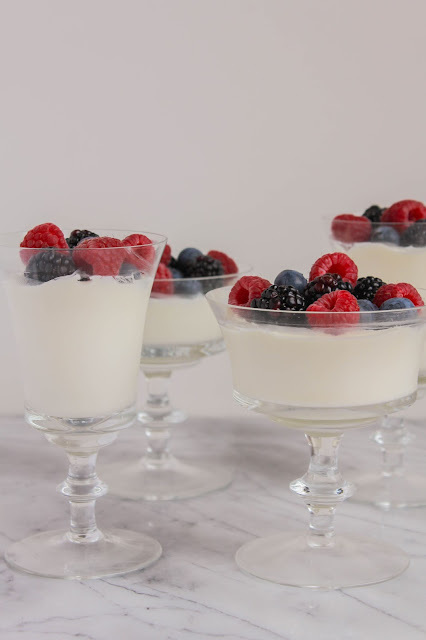 Panna cotta can be garnished in many different ways, but I love serving mine with fresh berries. 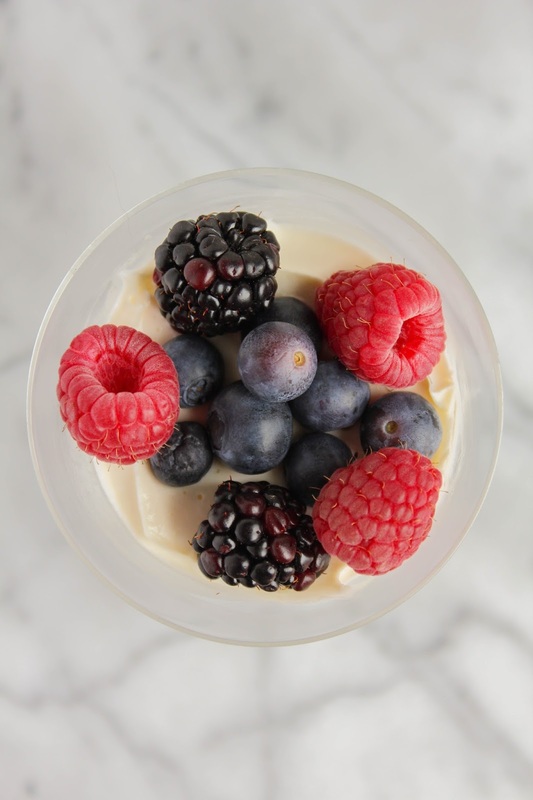 Raspberries, blackberries and blueberries are a stunning visual combination setting atop the creamy dessert. Be sure to take a look at all of the amazing Italian recipes my Sunday Supper friends have shared this week! There are so many I want to try, I think I'll be busy in the kitchen for a while. Now, who's ready to make an easy, delicious dessert? Pour the milk into a medium saucepan and sprinkle the gelatin over the top. Let it stand for 5 minutes to soften the gelatin. Put the pan on the stove and cook over medium heat, just until the gelatin dissolves and the mixture is warm, about 5 minutes. Add the cream, vanilla, sugar, and salt, and stir until the sugar dissolves, about another 5 minutes. Be sure not to let it boil! Remove from the heat and pour into 6 dessert or wine glasses, about 3/4 full. Cool slightly, then cover each glass with plastic wrap, carefully pressing it directly on top of the panna cotta. Refrigerate until set, at least 4 hours. Spoon the berries on top of each glass of panna cotta and serve.